A well-known panel maker that produces various sizes of thin-film-transistor liquid-crystal display (TFT-LCD) panels and touch panels was eager to improve efficiency in all of its factories through the implementation of a production line monitoring system. The company selected its factory in Nanjing, China, to be the first site for implementation. After which, the adopted intelligent applications would be subsequently rolled out to its other production bases around the world. By adopting Advantech’s intelligent WebAccess/SCADA software combined with its WISE-4000 wireless I/O modules into a cost-effective wireless solution, the panel maker was able to link all front-end production line machines into a single network with the flexibility to support future integration and expansion. This allowed the panel maker to rapidly implement equipment networks and process visualization for increased productivity. In the past, all factory production equipment was managed manually. In the event of an equipment failure, the operator would need to report the problem before arranging maintenance and repair. Additionally, because machine status records were not kept, managers were often unaware of the production line situation. To address this issue, the panel manufacturer decided to leverage equipment networking and data acquisition technologies to implement a production line monitoring system. By recording the status of the three-color warning lights on machines and integrating counting and timing sensors, managers would have a better understanding of the output and operating speed of each machine. 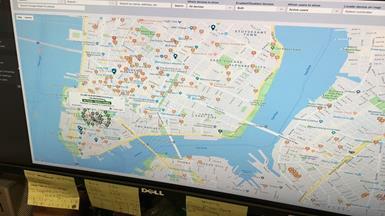 The collected data would also provide a valuable reference for improving production scheduling and productivity. To facilitate machine status monitoring, the collected data needed to be transmitted to a monitoring station. However, because of the Nanjing factory’s complex layout, installing a wired network was not possible. The new solution needed to be capable of collecting and transmitting data to the management center via the factory’s existing wireless network. Moreover, the wireless device had to be easy-to-install and compact to avoid occupying too much space. Because the work-in-process (WIP) inventory passes through a workstation every 3 to 5 seconds, the wireless module responsible for collecting data must have sufficient speed to acquire real-time signals (accurate to 0.1 seconds). Regarding software, the panel maker did not want to invest substantial resources into developing a unique platform, preferring instead to purchase an off-the-shelf remote monitoring solution. For use as a host computer management system, Advantech’s WebAccess/SCADA software was required to support on-site data processing, chart analysis, production reports, and alarm notifications, while also offering convenient connectivity and data access. SQL server support was also necessary to facilitate integration with the back-end manufacturing execution system (MES) and enterprise resource planning (ERP) system. Advantech provided a production line monitoring solution that combines WISE-4050 IoT wireless I/O modules with its WebAccess/SCADA software. At the front-end of the solution, multi-channel digital I/O WISE-4050 modules connected to the three-color warning light and counting/timing sensors of the machines collect and wirelessly upload signal data to the back-end management system. At the control center, the WebAccess platform is used to dynamically display the collected front-end data, enabling managers to remotely monitor the production line equipment. The collected data and periodically generated reports can also be used to analyze equipment utilization. 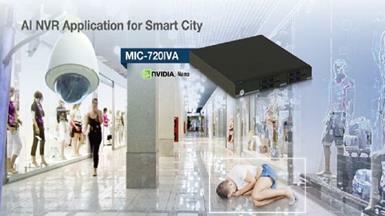 Advantech’s wireless WISE-4050 module supports data logging with RTC timestamp and is capable of handling more than 10,000 data samples. In the event of a network disconnection or interruption, data can be temporarily stored in the internal flash memory; after network recovery, data upload operations can be resumed without data loss. The counter function records the number of WIPs. This allows users to calculate the time difference between WIPs in order to evaluate the production efficiency. With support for multiple communication protocols, including Modbus/TCP, TCP/IP, UDP, DHCP, and HTTP, and RESTful web APIs, WISE-4050 module ensure captured data can be easily transmitted to diverse software programs and systems for analysis. 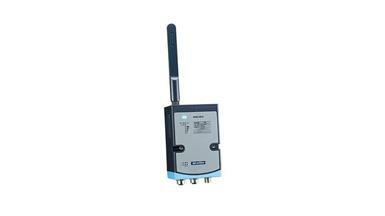 Moreover, integrated wireless technology enables data communication without additional wiring. To facilitate flexible installation in complex and potentially crowded factory environments, WISE-4050 is compact (80 x 148 x 25 mm) and compatible with DIN rail, wall, and stack mounting. Considering the size of the panel factory in this case, Advantech supplied its WebAccess Professional software platform with 600 tags to ensure sufficient access rights for production line monitoring. This software provides powerful SCADA management functions, including animated graphics displays, real-time data updates, scheduling control, trend analysis, alarm notifications, and action logging. Equipped with numerous drivers, the WebAccess platform facilitates communication between a whole range of factory devices, including desktop computers and mobile systems. Additionally, because WebAccess is a 100% web-based solution, all engineering, database configuration, graphics building, software administration, and monitoring operations can be conducted remotely via a standard web browser. WebAccess allows real-time data, operator actions, and other system logs to be stored in ODBC databases, such as SQL Server, Oracle, MySQL, and Microsoft Access, for integration with MES, ERP systems, and other IT applications. Furthermore, with Advantech’s software customization services, the production line monitoring solution was adjusted to satisfy the panel maker’s specific usage requirements. In response to the trend towards intelligent manufacturing in today’s IoT era, Advantech’s latest WISE-4000 series modules provide not only wireless I/O functions, but also data acquisition, pre-processing, and direct upload capabilities. 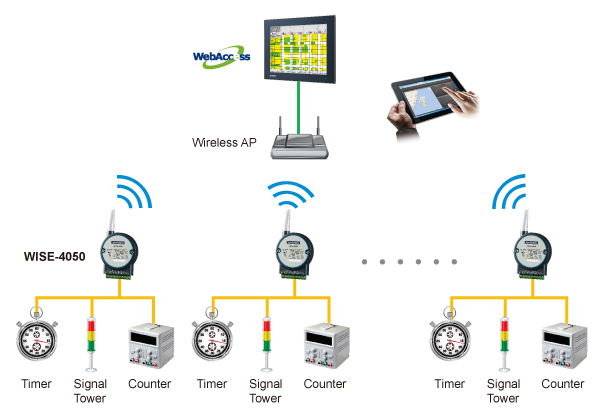 The various modules in this series support wireless data collection and transmission to a cloud platform or management system to facilitate the rapid deployment of intelligent factory applications. Similarly, Advantech’s web-based WebAccess software platform is equipped with numerous advanced features that enable remote control and management, while its open architecture and open interfaces ensure system integration. For this project, Advantech provided a remote monitoring solution that comprised its multi-functional WISE-4050 modules and WebAccess/SCADA software for accurately collecting data and generating relevant charts and reports. By including support for multiple standard interfaces, this solution also enabled the downward linking of various devices and sensors as well as the upward linking of existing manufacturing systems. Because Advantech’s offering integrated hardware and software into a total solution that allowed the panel maker to quickly and conveniently implement production line monitoring, the company plans to use Advantech products to support other IoT applications and improve productivity throughout all of its factories.